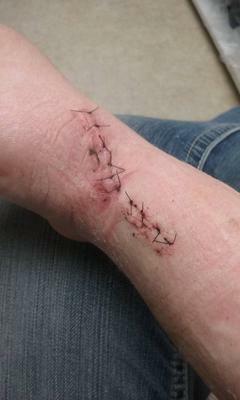 I was injured in 2013 at work; I am a CNA and work with elderly patients. I was diagnosed with De Quervain Tenosynovitis. I've tried everything from multiple injections to physical therapy and occupational therapy, Pain management, 3 surgeries, seeing almost all the specialists in my area. I am still not healed and have been out of work since my last surgery in June of 2016. I am in pain constantly, nothing takes the pain away. i'm on a contract with a pain cinic, doing occupational therapy, doing a ritual of ice/heat and massage and while all of this helps for an hr or two, nothing helps completely. The first surgery was unsuccessful in that the surgeon didn't do the procedure right, he didn't wrap the tendons right and ended up wrapping a nerve into the tendons, which injured the nerve, a little over a year later after doing physical therapy for forever and still not making progress I had a second surgery in Oct of 2015 to repair and fix what the doc had later found out what had happened. after that second surgery I still wasn't having any relief and in physical therapy, I would get to a certain point only excelling a couple points in all areas my therapists would test, we tried a few injections to see if they would work after the second surgery and found out that my body doesn't like cortisone and I had an adverse reaction to it. Which lead us to pain management where I was put on Lyrica, Cymbalta, and zipsor. these did make the pain, for the most part, go away, but only enough so that I could function a little better than I had been. I was able to return to doing crocheting and was able to start driving my car without a brace and was starting to be able to do the dishes in a timely manner again instead of it taking 2 hrs due to the pain but I had no strength and couldn't even pick up a gallon of milk. So after trying various drugs and seeing several other physicians, surgeons and plastic surgeons I found a surgeon who thought I had a neuroma and talked to me about doing a third surgery to remove it and re-do the tendon release surgery and remove some scar tissue since it wasn't dissolving on its own. know if this would help if I don't give it a shot." I agreed to a third surgery in June of 2016. Since last June I've struggled with doing a lot more than I have had to since the second surgery. The pain has been different more sore and numb and more like nerve pain but still achy and I can't hold anything in my hand for very long, or write for longer than a could word at a time. I've had to increase my dose in my Lyrica to help with the pain and am now seeing the final and last doctor in Idaho that I can see before I have to seek treatment elsewhere, such as university of Utah hospital. I am back in physical therapy to help with AROM and Pain. I'm currently wearing pain patches 12 hrs a day over my incision site to try and help with pain on top of my medications. I'm so very frustrated with this whole ordeal. my new doctor thinks that another nerve is involved in the injury since the last surgery. and I am really not wanting a 4th surgery to "see if it will make it better" or at least tolerable so I can continue with my life and return to work. August will be 4 years since my injury, I'm really ready for this to be better! not to mention finding a new job is close to impossible because of the pain and the liability for any company to hire me. I really don't want to be on pills my entire life! What would you suggest I do? what do you think would help in this predicament? The picture attached is from my last surgery in june 2016. 1. You mentioned an original 'injury' a couple times. Did you have an actual rip/tear injury, or are you just referring to pain from DeQuervain's tendonitis? Tendonitis generally doesn't have an 'injury' component, though tendonitis absolutely can/does develop after/along with a rip/tear injury. 2. It sounds like that first surgeon jacked up your nerve, the second surgeon caused more trauma and didn't help anything, and the third surgeon (who was just guessing that there was a neuroma in there???) made things even worse. That is unsurprising. Surgeons thing that surgery is worth it even if it just 'might help, maybe'. That's a big scar you're showing there. That's a lot of trauma to an already unhappy and possible damaged dynamic. That's pretty par for the course. If you don't have actual nerve damage (the surgeon(s) severed, nicked, or overstretched the nerve) that's good, you should be able to lower pain levels significantly. It's unlikely that more 'time' and/or Rest will help this improve....you're stuck in a bad pain dynamic now...and that includes multiple factors all working together to keep you hurting etc. One factor is a chronic (acute) Process of Inflammation. Which dumps lots of pain enhancing chemical into the area, constantly. 4. "What would you suggest I do? what do you think would help in this predicament? " In general I would suggest that you get and start working with my Reversing DeQuervains Tendonitis program. You have to reverse all the factors that caused your initial pain and symptoms, the factors that surgery A. totally ignored and B. made worse. Your original pain is from (primarily) three factors: too tight muscle and connective tissue, inflammation, and nutritional lack. For instance, you went into a traumatic surgery with not enough nutrition to optimally recover. And then the surgery caused more problem, which long story short required even more nutrition from your body...that it didn't have....and still doesn't two more surgeries and multiple years later. You're body (basically) can't recover in it's current state. But you can help it go that direction. How much better can you get? I don't know, and there's only one way to find out: do the work, see what results along the way, and reassess and fine tune as necessary. But if you don't reverse the factors causing some/most/all of the pain, your body has already proven not to be able to.